And it begins with the truth that we are still talking about illegal immigration--not "immigrants" or "migrants" or any others who might legally lay claim to opportunity in this country. Let's dispense will all the talk of racism, nativism, and the rest. We have all seen, heard, and read the dribbling rants of those who are racists out there. We know them when we see them. There are elements of that everywhere and on both sides of this debate. They are the fringe, the out-landers to the American Dream--but they are a noisy lot at times and ultimately cowards. Let us set the misanthropes aside as history undoubtedly will do and get ourselves on to the business at hand. I am a native Arizonan (not of the "Native-American Tribal" variety, but still enough of a rarity) and have witnessed a great deal regarding illegal immigration first-hand. I have seen illegal immigrants who work exceedingly hard and generally within the context of legality (of course, excepting their immigration status) and I have been the victim of crime at the hands of....how do we now say this...."doubly illegals?" Again, I am not shocked by the fact that a societal subset contains elements of both. Any random set of humanity with sufficient scope would do the same. It is vital to remember that any solution must take into account the relative incompetence of the Federal government in administrating such programs. (Milton Friedman once said, "If you put the federal government in charge of the Sahara Desert, in 5 years there'd be a shortage of sand."). 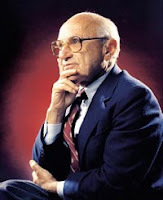 It is also important to view the current proposal in the context of the failures of the previous attempt in 1986 and to not repeat those errors (Milton Friedman also said, "Governments never learn. Only people learn."). But What About the Families and the Children, etc.? With regards to this issue it is also plain that many are leading from their heart. I do not fault them too much for this. Grace, mercy, and compassion are the hallmarks of my faith--political and theological. But we do not benefit those who wish to come to our country under noble goals and lofty aspirations if, by doing so, we lessen the quality or value of that which they seek to achieve. In so doing, the "economy" of Freedom is put into Recession and the sum total of "good" is diminished. If the mechanism is properly in place and the "market" for such remains governed by the rule of law, only then does each transaction (of immigration) add value to the whole. This is true of every system designed by the hand of man. Before I sign off, I would also offer that the majority of opponents to the bill (excepting a few) are not necessarily "pro-enforcement-only" as is commonly inferred. Rather, they are largely "Pro-enforcement-first" (not the same thing) and that any government unwilling to enforce current laws cannot be trusted to enforce any. "Those who oppose this legislation have a duty to propose an alternative." I would have hoped that the legislators involved might have asked this same question of us prior to their first, clandestine Drafting sessions. I assure you that I would have spoken up. Now, each attempt that I and my philosophical brethren make to contact our representatives is met with disdain, slander, and silence. "You want solutions and alternatives? Here I am John, but it appears that you will not take my call."